For many centuries the girl’s costumes were largely influenced by clothes worn by their mothers. Such copying of style continued until the early years of the 18th century. Victorian girl’s dresses were made of silk in case she belonged to an affluent family. Silk was the popular material used by the rich class of the society mainly to show off their wealth. If the girl was from a poor family, then the girls and their female relations wore simple clothes made from cotton, linen, wool and lesser coarser fibers. In the late 1600s, the English textile industry started cheaper silks production in Britain. However, the 18th-century dresses were less formal and less stiff. It made wearing those more comfortable for girls to move in. The industrial revolution helped bring in clothes that were cheap and lighter in weight. Victorian girls wore pinafores and smocks to cover their dresses. The embellishment of these smocks, pinafores and aprons depended on the occasion. In the early 18th century, as soon as girls started running around, they wore dresses made of muslin, lawn, dotted Swiss, white percale and nankeen. The progressing years of the 19th century showed that the fashion of children’s clothes was what the adults wore but it was never burdensome. 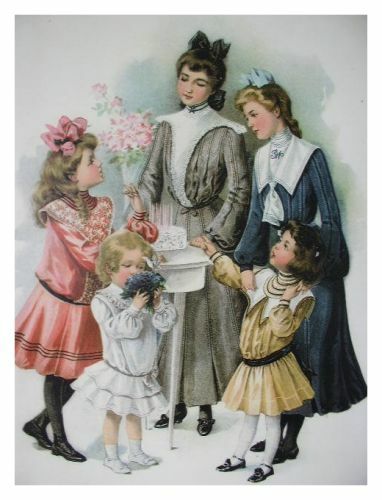 In the mid-Victorian era, children’s clothes used to feature in fashion magazines and in fashion plates. During the 19th century, under/ outer garments known as pantelettes were commonly used. By 1825, people were fashion conscious. There was plenty decoration on the dress in form of ruffles, flounces and fur trims with the waistline moving down like adult dresses, along with decorated hats and bonnets. The 18th-century girls wore floor length gowns. The skirt length of a girl was a sign of her age. Young girls in the early 18th century shortened their skirts. Girls of seventeen or eighteen years were considered to be a young lady. Large sailor-style collars and contrast rows of braiding ornate girls clothing in the late Victorian era. Girls wore a flower and ribbon trimmed hats or bonnets. Puce, plum, scarlet red and navy were the strong colors worn. The invention of the sewing machine enabled the garments to be decorated with extra frills and pleats. Fur muffs formed an essential accessory for the well-groomed child.